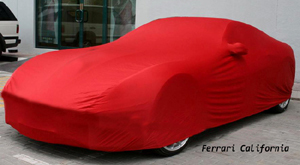 Geza Gear Custom Car Covers are now available. Custom Covers for Cars, Trucks, SUV's, RV's, Boats, Yachts, Watercraft, Aircraft and so much more! If you need it covered and protected, we can do it! 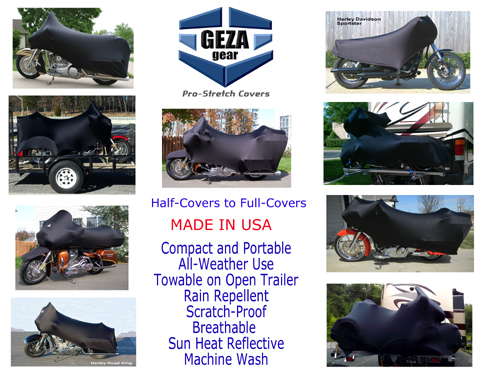 Geza Gear Patented Pro-Stretch Custom Motorcycle Covers are 100% Custom Made to Order and Proudly Designed and Built in the USA with the utmost attention to quality and exacting detail. Everything, from our patented technical fabrics to the designing, modeling, fabrication, cutting and sewing is built/performed by us in our own factory. 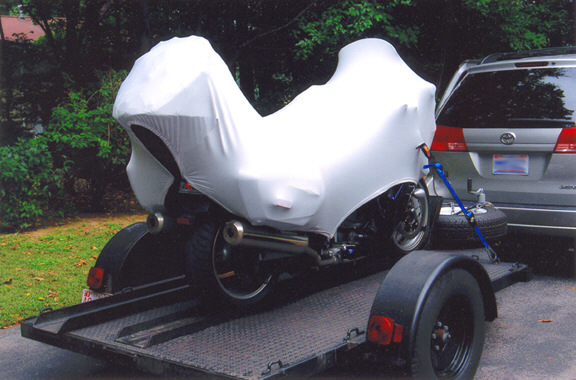 Our custom motorcycle covers are built to perfectly fit and protect every type of motorcycle from all leading manufacturers. 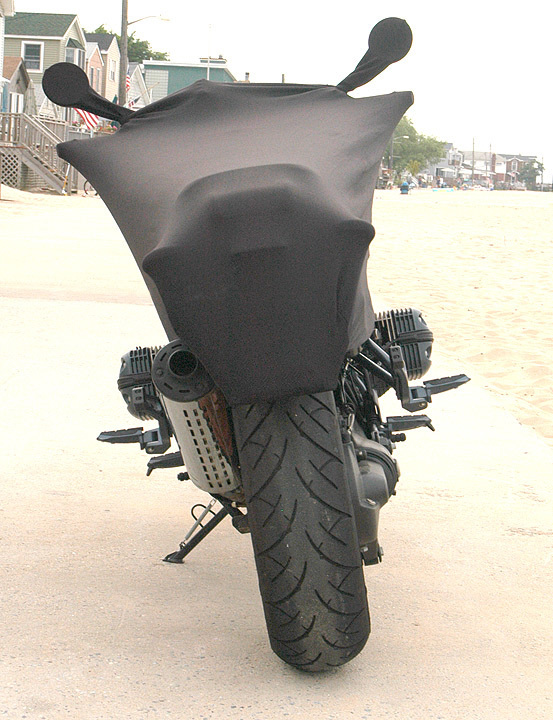 Every Geza Custom Motorcycle Cover is cut and sewn from our Patented Designs and meticulously constructed from our proprietary and patented fabrics to achieve a flawless form fit around your exact bike. 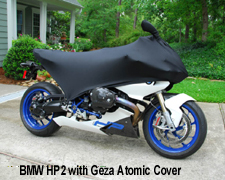 Geza Stretch Fit Custom Covers are True Custom Built- meaning we take the exact pattern of your exact year, make and model of bike along with any accessories you may have, and we cut and sew a cover to perfectly fit your motorcycle's dimensions and contours. We have an extensive motorcycle database with over 8000 patterns and more than 2500 aftermarket accessory patterns - ranging from extended windshields, shorty shields, no shield, sidebags, topcases, engine guards, luggage racks, backrests, beach bars, extended bars etc. Further, you have a choice of eight different fabrics from which to have your custom cover built around. This way, not only do you get an exact fitting cover, but you also get a cover made from the ideal material of your choosing to meet your exact needs. 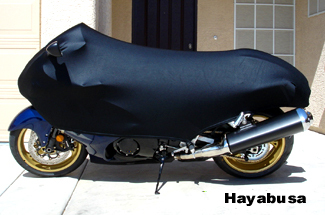 We can build custom motorcycle covers for your Sport Bike, Cruiser, Sport Tourer, Harley Davidson, Trike, Dirt Bike, Standard and Naked Bike. 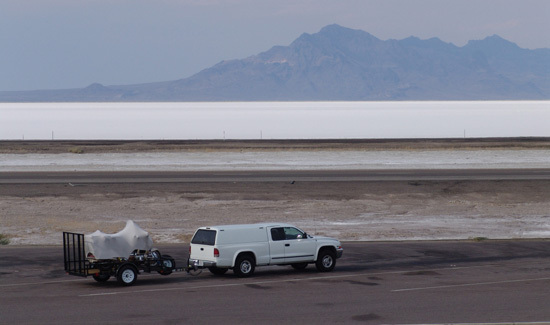 Our most popular designs are our half covers, but we can also build custom full covers that are compact and easily portable for every day use as travel covers, as well as towable / trailerable on an open trailer, in the bed of a pickup truck or even behind an RV. 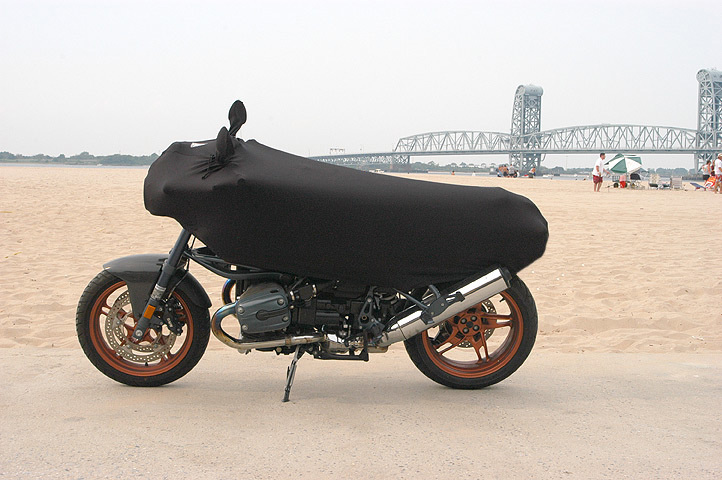 We have custom motorcycle cover patterns for every Aprilia - Bimota - BMW - Buell - Ducati - Harley Davidson - Honda - Kawasaki - Moto Guzzi - MV Augusta - Suzuki - Triumph - Yamaha and others. 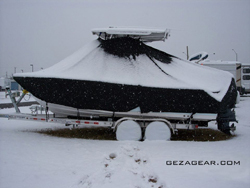 Whether your needs are for trailering or transport, needing a small travel cover, commuting to work, going on road trips, needing protection from the sun, rain, snow, outdoor debris, indoor dust, or to keep people from unauthorized "sitting" on your bike, Geza Gear custom Motorcycle Covers can meet your needs. Traditional sizes such as Small, Medium, Large and X-Large do not fit properly on every bike. Therefore, Geza Custom Motorcycle Covers are built around your exact bike model. Our pricing structure is built around the Small to X-Large designation, see our Size Guide, and when it comes to ordering your cover, you simply choose the corresponding cover size (for pricing) AND provide us with your bike's year, make and model. 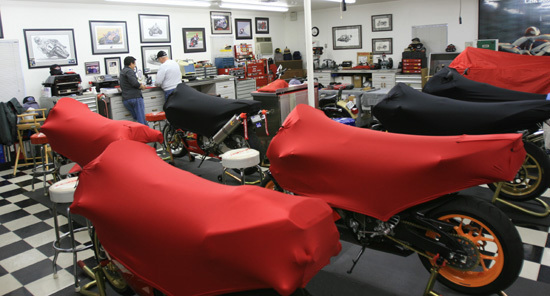 We will pull your exact bike pattern and make you a perfectly fitting motorcycle cover from the material of your choice. 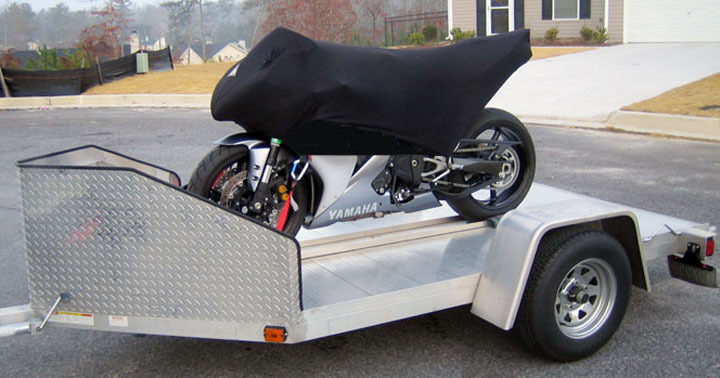 We have designed our site to provide all the motorcycle cover information you need including sizing, fabric series choices, pricing, customer testimonials, and pictures. We pride ourselves in developing lifetime customer relationships by using only the best materials with the best cover designs. 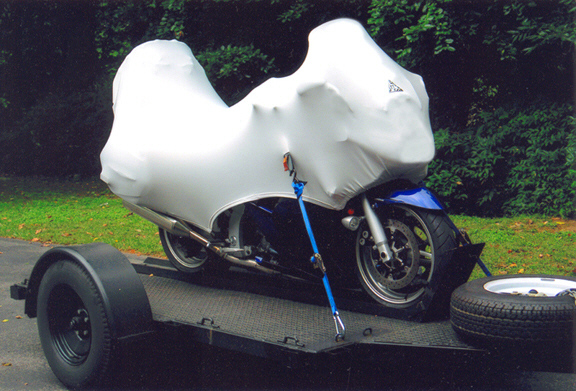 Since we manufacture our own fabrics and design each and every motorcycle cover pattern, which have all been awarded Patents, you are assured of superb performance and fit. Someone once said, "The bitter taste of poor quality remains long after the sweetness of low price is forgotten." We could never have said it better, and we will never compromise on quality, innovation, performance and value. Motorcycle Covers are not all created equal. To see the Geza difference, scroll down to read some of our many Testimonials. Take your time and enjoy our website as well as the picture slideshow featured at the top of this page. If you have any questions, or if we can be of assistance, please feel free to contact us. 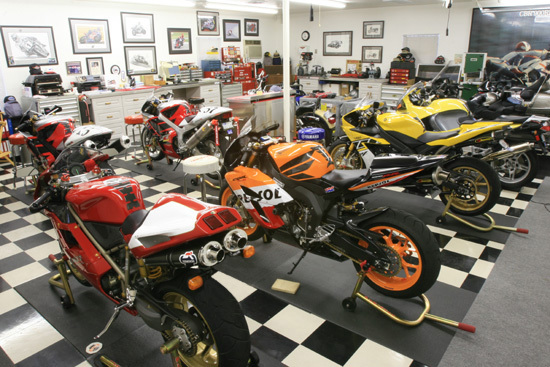 This air conditioned DREAM GARAGE, (the kind that comes with a house! ), belongs to one of our customers. Not only does he have more top-shelf motorcycles than there are days in the week to ride them, but he has enough Geza Motorcycle Covers to tuck them in at night. When it comes to passion and quality, this customer clearly knows no compromise! 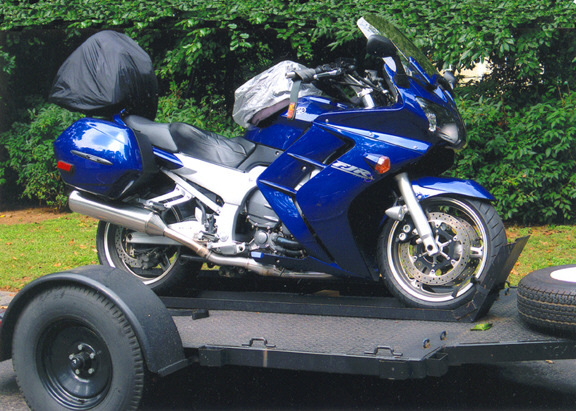 For that Dream Road Trip you've been planning, the Custom Geza Motorcycle Cover, shown fitted on a GoldWing 1800 being towed cross-country, will protect your motorcycle wherever the open road should take you. And when you finally arrive at your destination, your Geza Cover is compact enough to carry with you as the perfect travel cover. Transportable and portability, all in one cover!